Lyman Hall was born in Connecticut in 1724. He studied medicine at Yale College, graduated in 1756 and went to Charleston, South Carolina, shortly after to establish a medical practice. He bought land in Georgia in 1760 and established a plantation there, while continuing to practice medicine. Two years later he returned to South Carolina, still as a physician. 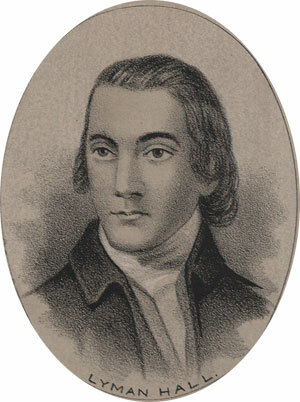 In 1774, by this time partisan in revolutionary politics, he again came to Georgia and earned the unflattering attention of the Royal Governor, James Wright. He also secured election to the Continental Congress, where he was involved in provisioning food and medicine for the Revolutionary Armies. He was reelected to congress through 1780 but retired to his adopted state in 1777 when state matters, including the situation of his longtime friend Button Gwinnett, demanded his attention. A short time later, the war reached Savannah. Hall’s property was burned and he stood accused of high treason. He fled to Charleston, which was also overtaken by the British. He then fled to Connecticut, some say, where he was harbored by family.